Fun Nintendo figure safe for the whole family! From Bumpkins, this Super Mario Bros. 8-bit style figure is specifically designed with textures to soothe aching gums, so you can share your favorite game with the next generation. It can also be refrigerated or frozen for additional relief! Easy to clean and dishwasher safe, it's safety tested, BPA free and non-toxic. Made of 100% food grade silicone, intended for ages 3-Months and up. 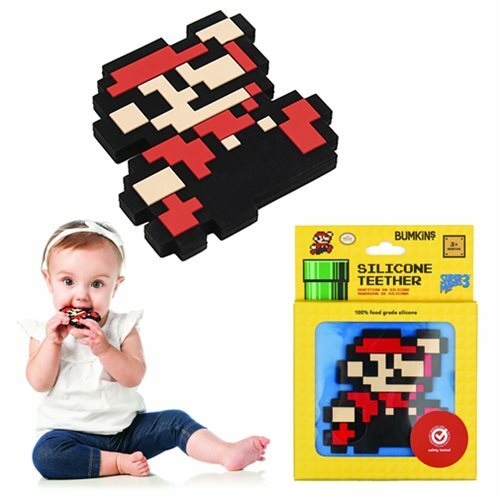 Expand your Nintendo or Mario collection with this Nintendo 8-Bit Super Mario Hand Held Teether! Measures approximately 2 3/4-inches².